Next post: Now THIS is more like it! I have been rethreading the loom for two days now.Â Attempting to rethread would be more like it; twice I’ve had to pull out a portion and rethread it, and am about to embark on my third rethreading.Â The problem is that I’m threading three layers of warp on three sets of lease sticks, and the gold threads in particular are very fine and easy to miss.Â Normally this isn’t a problem but when I’m trying to find them on the bottom set of lease sticks with two other layers of warp in the way, well, it’s easy to make mistakes. This is, of course, incredibly frustrating, and when confronted with the latest setback, I decided to roll with the universe’s broad hint: do something else! So I have been working on my articles for Handwoven, prepping my talk for Monday (I’m speaking to the Silverado Weavers’ Guild in Napa), and knitting up some blanks to paint for weft, should I ever manage to get this warp threaded! What am I hoping to accomplish with this article? What editorial constraints do I have? These are pretty complex questions, and I have by no means got a final answer for any of them.Â I know my own general goal – to empower the weaver who wants to learn how to design his/her own fabric – but that does not help me nail down audience, and juggling both of those against the editorial constraints makes for a complex and thorny problem.Â I may just write thirty pages as a rough draft, covering everything I want to cover, and then start cutting. Anyway, this is making me think deeply about profile drafts, which is good, and is also making me think deeply about Handwoven, which is also good.Â I think the last two issues were particularly meaty for the designing weaver, but it’s been awhile since I read the magazine seriously, so I want to go back through a couple of back issues to see whether the magazine has changed recently or I’m simply paying more attention.Â Having been asked for my opinion by the editors of Handwoven, I feel obliged to provide an educated and thoughtful one.Â And, having been asked to contribute content, I want to make that content as rich as possible while remaining compatible with the general editorial direction of the magazine.Â So I am putting a great deal of thought into this. This requires a bit more explanation, I guess.Â This knitted blank is the 20/2 tencel I’ve been using for the warp and weft.Â Each row of knittingÂ is about the length of two weft shots; because it is being woven at 40 epi, every 20 rows provides enough weft for one inch of weaving.Â I have therefore marked off every 20th row by making one row of bigger stitches.Â Because my warp changes colors roughly every five inches (200 picks), I have also marked off every 5″ section with four rows of bigger stitches.Â This way I can get the color changes at least roughly lined up, though I expect I’ll have to do some fiddling when I actually come to weave it. Lest you think this is clever of me, I must enlighten you: I got this technique from Nancy Roberts of Machine Knitting to Dye For, who not only sells knitted blanks, but will custom knit them for you if you get in touch with her.Â (She also teaches some very well-received classes on dyeing and using knitted blanks, and is a machine knitting wizard. )Â If I can manage to settle on what I want in a knitted blank, I’ll probably have her knit up my blanks for me with her electronic, automated machine; one or two short blanks on a hand powered knitting machine is kind of fun, but longer ones would be incredibly tedious. Tomorrow I plan to dye the knitted blanks, work some more on the Handwoven article, prep my talk for the Silverado Weavers’ Guild, and pick Mike up from the airport.Â He’s been in Chicago the last few days, and I’ve missed him!Â It will be good to have him back. And – oh yeah – I might get back to threading. 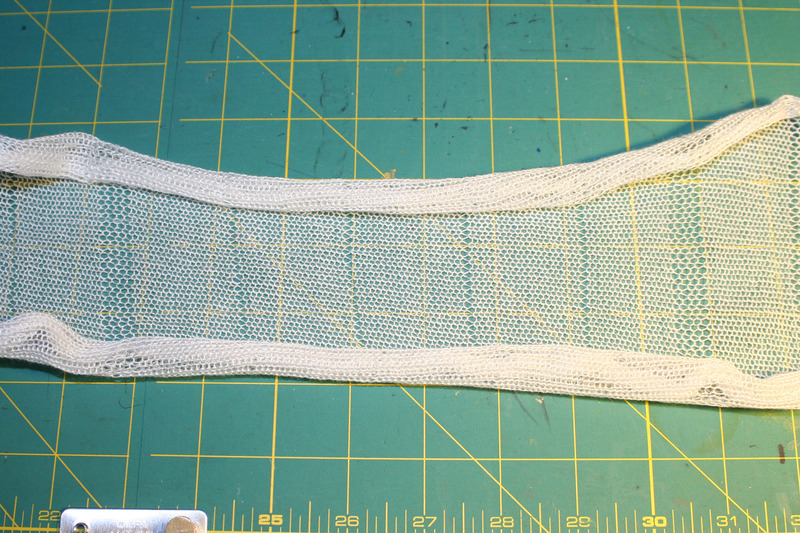 I have played with knitting blanks, dyeing them, and using them for weft. So far, I’m not thrilled w/ the results. I used the knitted/dyed blanks on a white warp. I’m think I might try them on a painted warp. That may be too much going on, or it may be eye-popping. We’ll see. I work on a creaky, second-hand knitting machine and haven’t been able to use it since I had my shoulder repaired a year ago. Even before the shoulder repair, I had to move the carriage w/ both hands, so I’m not sure whether, even a year later, my shoulder will be able to take this level of workout.